A page attempting to categorise Chance Fiestaware 'Aqualux' patterns	and	associate	it with a photograph (work in progress). Compiled with the help of Max, Anne, Anne B, Sue, Robbo and Tony H from GlassMessages.com. 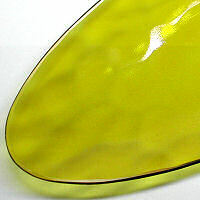 Other data was sourced from Lesley Jackson's 20th Century	Factory	Glass and Smethick Heritage Centre Trust (SHCT). Carnival 1963: reintroduced and commonly seen	as dishes	or Handkerchief vases. 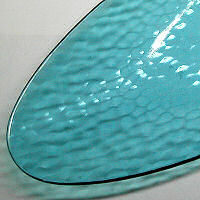 Known colours are Blue, Green,	Turquoise, Amber,	Clear & Amethyst (the latter two being scarce). Gilt rims were introduced from 1965.